1 3/8" Transitional decorative clip ring that coordinates with designer metal curtain rod poles. Clip is removable for use with standard drapery pins. This decorative adjustable traverse rod comes with 20 slides. Rods are metal, slides and finials are plastic. Extra slides are available. Brass drapery rods are expensive, the Traditions gives you the brass look without the cost. Projection 3 1/2 to 4 1/2 inches, includes mounting hardware. Priced each. 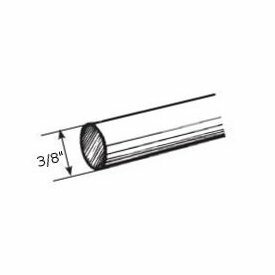 Clearance 2" to 3", projection 2 1/2" to 3 1/2". Brass finish curtain rod bracket for 9/16 inch cafe rods. Thumb screw for locking curtain rod in place. Priced by the pair. 1 1/2 elegance 2 decorative cafe rods 48-84"
Double curtain rod support returns 5.5 to 6.5"
5 inch projection wall mount bracket for 1 1/2 inch diameter indoor or outdoor curtain rod. Includes hidden lock screw to hold rod. Available in two colors in stock, ready to ship. It can be used indoor or outdoor. Use on those windows that face patio or pool area, or use inside on any window. Charleston collection by Design Elements. Tuscan finial for 2 1/4 inch wood curtain rods. Size is 7 inches long by 3 3/4 inches wide. In stock colors are ready for quick shipment from factory. Renaissance Collection by Design Elements. Decorative wood brackets for 2 1/4 inch wooden curtain rod. These wooden curtain rod brackets have a 3 3/4 inch return. Over all size is 7 1/4 inches high by 1 inch wide by 6 inches deep. Wood curtain rod brackets for the Renaissance collection. Wood wand 39 inches long for wooden curtain rod. Baton for decorative curtain rods for any window. Renaissance Collection by Design Elements. Material: Select Hardwood Priced each. 12 foot twisted wood curtain rod 2 1/4 inch diameter. Decorative curtain rods for any window. Renaissance Collection by Design Elements. Metropolitan modern curtain rod finial. Use with tab top curtains, eyelet curtains or pinch pleat draperies. 3" projection 2 1/8" H x 4 3/8" D.
Custom iron collection inside mount brackets for the 1 1/2" custom rods. Elizabethan finial for 2 1/4 inch wood curtain rods. Size is 7 1/8 inches long by 4 inches wide. In stock colors are ready for quick shipment from factory. Renaissance Collection by Design Elements.